At the time of bending a reinforced steel bar at some angles (degrees), owing to elongation in steel, length of steel will be raised to some extent. Prior to arrange the bars in structural components, the steel bar should be cut, for this purpose, it is necessary to work out the perfect length of bar (cutting length). 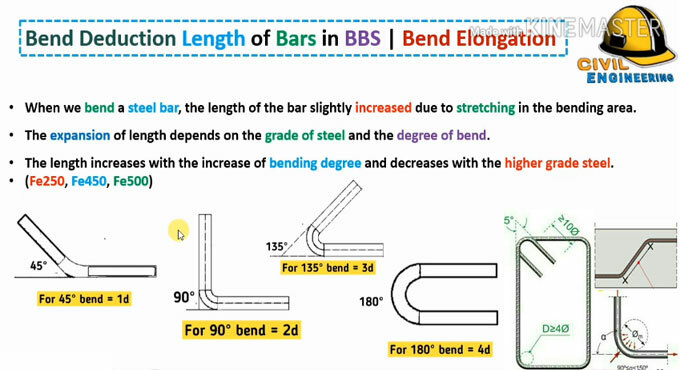 With the purpose of working out the cutting length, it is required to subtract elongated length of bar because of bend. It's fully based on the degree at which the bar will be bent. While bending a steel bar, the length of the bar is raised marginally because of expansion in the bending area. The enlargement of length is based on the grade of steel and the degree of bend. The length is raised with the rise of bending degree. The length is decreased with the greater steel grade. To get more clear ideas, go through the following exclusive civil engineering video tutorial.